It provides the best possible image at this price point. It is super easy to set up and for the most part, easy to operate. The projector comes at a fantastic price. Summary: Overall, we feel that the BenQ TK800 is a fantastic home theatre 4K projector that can compete with ambient light in a majority of situations while still producing a great picture. It has all of the connection types that you will ever need, in addition to sporting a very solid set of features. Over the past couple of years, we have seen near-cinema quality projectors fall considerably in price, allowing almost everyone the ability to transform their living rooms into free-to-use theatres, all for about the same price as a high-quality flat screen television. However, this fact is met by a frustrating reality for most consumers. While projectors have managed to become far more affordable recently, few affordable projectors that are available on the market today are able to work well in anything besides complete darkness. This can lead to a frustration scenario – the need to purchase living-room blackout shades right after investing in a new projector – that is enough to make even the most dedicated videophiles seething with frustration. Thankfully, the skilled team over at BenQ managed to recognize this common setback and have managed to release a high-quality projector that is both beautifully designed and able to clearly project a stunning picture in even the brightest of rooms. Jam-packed with 3,000 lumens of brightness, the BenQ TK800 home theatre projector might not be able to work in direct sunlight (as is the case with almost all projectors on the market today), but it manages to deal with significant amounts ambient light far better than similarly priced 4K projectors. With a price tag of less than two thousand dollars at most retailers, this projector allows for impressive levels of color accuracy that we have come to expect in projects that typically cost thousands more. For our research, we have concluded that the BenQ TK800 just might be the perfect projector solution for those of you looking to create your first home cinema setup. In an effort to give our readers the best overview of the features, benefits, and drawbacks offered by the BenQ TK800, we’ve decided to create this in-depth review to help give our readers a better idea of just what this projector has to offer. While we’ve made our minds up regarding the awesome nature of this projector, we want to give our readers the opportunity to make their own purchasing decisions. So, is the BenQ TK800 the right projector to add to your new home theatre? Read on to find out for yourself! Who is the BenQ TK800 Home Theatre Projector for? Overall, we believe that buying this product would be a great purchasing decision for those looking to outfit their first home cinema. This is especially true for those of you who are planning on creating a new home theatre setup in a room that receives lots of natural ambient light from the outdoors. While anything besides pitch-black viewing has been known to render most projectors useless, this is not the case for the BenQ TK800. Instead, the TK800 is able to overpower ambient light issues while providing a great projection experience. For products in this price range, the picture is great — we’d even go as far to say that it is second-to-none when considering the picture quality of most budget-friendly projectors. Thanks to its great combination of value, quality features, and versatility, it will likely be hard for our readers to find another projector that works this great, especially on a budget-friendly basis. With this being said, we realize that a little under two thousand dollars might be a bit too much for many of our readers to spend on their first home theatre projector. On the other hand, many of our readers consider themselves to be dedicated home cinema hobbyists, and very well might be willing to dedicate more money to their next projector. If you believe that you fall into either of these categories, then we feel like the BenQ TK800 might not be the best projector option for you. While we want our readers to have access to the best home theatre experience possible, we cannot in good conscience tell our readers that they should purchase a particular projector model that is outside of their price range, even if it does offer a great host of features. Simply put… If you know you want a 4K projector, this is as a good a deal as you could get for this kind of quality. If you’re simply looking for a projector, and you’re not super crazy over 4K quality, a cheaper option might be your best bet. At the end of the day, if you are willing to dedicate a little more time to search for the best home theatre projector for you, then we are confident that you will be satisfied by the experience it provides for years to come. What notable features does the BenQ TK800 Home Theatre Projector offer? Whenever we review a projector that is highly touted throughout the home theatre community, we typically run into one of two problems. 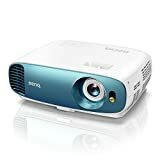 Either the features offered by a projector are super advanced (think 3D content projection) and only appeal to a few of our readers, or there have been so many high-quality and user-friendly features packed into the product that it becomes difficult to decide which ones to focus on through our review. Luckily, this is the case with the BenQ TK800, as it offers no shortage of advanced yet usable features which we are sure will appeal to the large majority of our readers. As this model is an upgraded version of the BenQ HT2550, it boasts the same great imaging processing chip, which allows for some fantastic visuals sure to help you get the most out of your home movie theatre experience. This proprietary image processing chip, created exclusively by the team at BenQ, offers 8.3 million pixels and a special HDR processing feature that aims to provide an optimal balance between color and contrast. As we mentioned previously, the BenQ TK800 Home Theatre Projector really separates itself from other competing models when it comes to brightness. Where the similar BenQ HT2550 comes with a reasonable rating of 2,200 lumens of brightness, the BenQ TK800 manages to blow away the competition with a significantly higher rating of 3,000 lumens of brightness. Due to this fact, the BenQ TK800 can clearly be considered to be the go-to projector of choice for those who intend on using their projector in settings where sources of ambient light may present more of an issue. It comes with a reasonable set of adjustment options, including a 1.2x optical zoom – which can allow for this projector to be placed at any location near or far from your screen. However, it is worth noting that the BenQ TK800 optical adjustment settings do not include the ability to use vertical or horizontal lens shifting, which means that the finer elements of image adjustment will be limited to the manual adjustment of the three rubber feet (one in the front and two on the back of the unit) found underneath the projector. With this being said, such issues will not present much as a drawback for those who intend on mounting this projector, as a standard projector mount and even more exotic mounting solutions are known to make finer adjustments far easier for the average user. The TK800 comes with fully automatic keystone adjustment, which will allow for your projected image to be adjusted so that it appears justified on the left, right, top, and bottom of your screen. This provides immense benefits to even the most casual projector customer and will help your movies, videos, and photos to appear more crisp and professional in nature when showing off the impressive image quality of the BenQ TK800. Furthermore, the TK800 also boasts a number of useful built-in picture modes, which include Cinema, Vivid TV, and Sport, in addition to two custom adjustable modes that can be designed and custom-built to the liking of more advanced projector enthusiasts. Thoughtful design that reflects the attention to detail that BenQ dedicates to its products. All too often these days, companies are satisfied with subjecting their customers to poorly designed and ugly looking projectors, many of which fail to deliver the high-level functionalities and image quality promised upon purchase. Thankfully, BenQ is a projector company that is well known for the commitment to detail and effort that they infuse within every product they offer, which is clearly reflected throughout the BenQ TK800. Sleek industrial design is complemented by a refreshingly approachable aqua blue faceplate, which makes this projector feel far more approachable than the dozens of ugly projectors currently on the market today. Overall, the exterior design of this projector isn’t a feature that provides increased levels of functionality, but it does make the BenQ TK800 easy on the eyes, which will actually make you willing to place it in a place of prominence within your home or apartment. As you have heard us say before, we are well aware that no projector on the market today could be said to be a perfect product. As is the case with most purchases, there are a number of pros and cons to carefully weight before investing in a new projector for your home theatre setup. Robust three-year warranty on parts and labor associated with repairs: While this warranty does not include lamps replacements, as a burnt-out lamp is considered to be normal wear and tear, BenQ does offer a separate warranty for lamps. In order to assure that their customers never have to deal with a faulty lamp, they offer a 180-day or 500-hour warranty from the purchase data on all of their lamps, whichever comes first. Low overall fan noise: While there is some audible fan noise when running in full lamp mode for extended periods of time, this is not annoying, excessive, or objectionable when compared to the significant fan noise produced by other projector models available on the market today. If you feel that the fan noise could be an issue, running the BenQ TK800 in Economic mode will make the fan virtually silent, with the unit only producing a low buzz that is barely audible, even in a near-silent room. Strong 3D performance: The fact that the BenQ TK800 offers 3D-capable content options at this price point already helps to set it apart, with this advantage being furthered by the fact that 3D content looks great when utilized. To drive this point home, consider this fact: the only other 4K enabled projectors available for less than two thousand dollars today include the Epson Home Cinema and Optoma UHD51A, both of which fail to provide the vast benefits afforded to the BenQ TK800 thanks to its impressive features. Very minimal rainbow artifacts: This issue is, unfortunately, a normal part of modern projectors, but it presents minimal distraction when using the BenQ TK800. Regardless of this encouraging factor, it is important to note that some people are especially sensitive to these visual artifacts, and there is no good way to predict whether you may be one of them. Large dark frames around the image: The BenQ TK800 creates a noticeable and very dark (yet not perfectly black) frame around the projected image. This is typical of DLP-style projectors, with the black frame taking up about 5% of the picture width. This isn’t a huge deal breaker, but could easily become distracting if projecting on a stark white screen. Limited 3D settings: While the inclusion of 3D functionality at all within a projector at this price range is a huge plus, this fact is slightly undercut by the limited and largely manual settings that can make taking advantage of 3D settings a pain for casual consumers. For example, 3D is only available for 1080p sources, and the BenQ TK800 will not automatically recognize a 3D source signal when it is connected to the projector. Furthermore, it is important to note that once 3D is manually enabled, any future 4K material that is displayed on the projector will be shown in native 1080p until the user goes back into the settings and manually re-enables 4K projection quality. Other than these glaring deficiencies, there aren’t a lot of negatives associated with this projector. Overall, it is a great, budget-friendly device that could potentially be a perfect fit for the home theatre setups of many of our readers. What are some alternative options to the BenQ TK800? 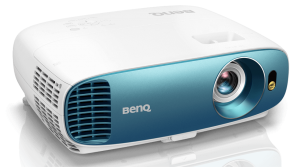 While we believe that the BenQ TK800 is a solid projector, especially when one considers its great features and rock bottom pricing, we realize that it might not be the best option for everyone. With this in mind, we would like to briefly cover a couple of other good options. 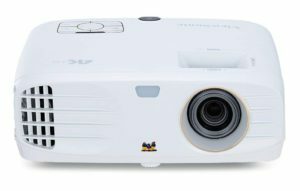 For one, the Vivitek HK2288 is a good example of a single-chip DLP projector that offers a design similar to the TK800 with an almost identical set of features. However, this projector is able to come in at a price point that is noticeably higher, thanks in large part to the utilization of a larger imaging chip. This is a tradeoff, as the larger chip enables nearly identical 4K performance at a greater cost to the consumer. Additionally, the BenQ HT2550 is a strong alternative, as it is another fantastic projector that hangs around the same price range as the TK800. However, the HT2550 offers a different set of advantages to consumers, as it has a much longer lamp life than the TK800, but it is only able to function properly in near pitch black rooms. If neither of these options interest you, then we suggest giving the Optoma UHD51A a brief look as well, as it boasts a great brightness rating of 3,000 lumens on paper, although it costs a little bit more than the BenQ TK800 at most retailers. Overall, we feel that the BenQ TK800 is a fantastic home theatre projector that can compete with ambient light in a majority of situations while still producing a great picture. This projector is a well-made product, and it has all of the connection types that you will ever need, in addition to sporting a very solid set of features. It is not only easy to set up and operate, but you will actually be able to get the best image possible at this price point.